It was hot and humid last week when I decided to go outside with my dad to his garden. First of all, I do not like yard work or working in anyone’s garden. However, this day was not about working in the garden but it was about spending quality time with someone I love deeply. Life has a way of taking us away from the things and people that mean the most. When I was out with my dad I had the awesome opportunity to hear some old stories that were important and dear to his heart. At the same time strengthening our relationship. In every relationship there will be times when you will be required to do some things that you don’t want to do. Just like toiling in that garden. The work was no fun but what I kept in mind is the harvest at the end from the work. I have a couple of real good girl friends and I promise you that it was work getting the relationships to where it is today. One of them did not like me when we first met. I paid her no mind and purposed in my heart to win her over. Now we are covenant friends for life. Most people would have given up if they were me but I understand the labor involved in any relationship. So now when people see us together they think we are natural sisters and they admire what we have. It’s easy to sit back and admire others’ relationship even to the point of jealousy. But you can have the same thing if you would be willing to invest your time and energy in your new or old relationships regardless of the work. Many enjoy the fruit from the garden but most don’t like the daily grind that’s involved. Time to invest in the people you love! On time word, loved it. God bless you Woman of God. Awesome word of wisdom. Thanks Dr.DeeDee. Happy 4th to you and your family. What an awesome reminder and a testament of the love you have for your father! Certain things in life are not important if you can’t share it with your loved ones! By the way, his garden looks really cool! I remember working in my dads garden too except I was too imature to realize the wisdom he was imparting into my life. Praise God for giving me a right now word when i need it. Love your ministry! Excellent! Your Dad’s garden looks amazing! Great post! Invest time cultivating the ground of current and new relationships…Received! Planting seeds into my relationship with my family and friends. Hello Kenya! you are the only one who can determine how long you will give this relationship. After you have tried and have discuss what you both want it will give you a better idea of what is required. There will always be a harvest regardless of the seed planted. Why waist time on useless seed ? Purpose to plant good seed !! Seed….. Time…. Happy 4th of July to the Freeman Clan! Always an on time word. Thank you Dr. DeeDee for the Monday’s nuggets to get started for the week. My father passed last year. Watching your video brings back fond memories of time he and I spent in his yard chatting. Thanks for sharing and encouraging! Thank u for this on time word. This spoke to my heart deeply. Me and my husband are invited to a barbecue today and I chose not to go because I will be returning to work tomorrow after being off recovering from surgery for 3 months. I used the excuse not to go so I could be prepared for work, taking away from my husband and spending quality time with family. I am going to the barbecue. God got this! Thanks for the word of wisdom. AWESOME! I pray you had a great time! Thank you and blessings. I was raised without a great relationship with my father. I always wanted to be a “daddy’s girl.” After my father passed away, I still had the opportunity to be a daddy’s girl by building a relationship with God, my daddy “abba”. You are right, it takes time, investment, and trust. If you have been hurt in the past trust can be an obstacle. I do need to work on my relationship with others. I believe the word of God says “A man that hath friends must show himself friendly: and their is a friend that sticketh closer than a brother” Prov. 18:24 (LJV). I consider myself friendly, but I don’t put a lot of effort into making friends. I’ll keep working on it. Yes Dietra I understand hurt has the ability to hinder if we let it but if I were you I would exalt love over trust. We are commanded to love regardless and to put our trust in God and not in man. Love has the ability and power to restore! Amen to that! I totally agree. I’m going to do just that be an investor in my relationship. What a good word for today! Your Dad is moving faster than me,lol.Happy 4th Dr.Dee Dee,luv u. Thank you for taking the time to share life lessons for our life, I receive and will do. This was so sweet, it brought tears to my eyes my Dad is 88yrs young =) and like your Dad Dr DeeDee he loves his yard. He can often be found at 2am planting flowers, laying mulch, painting, etc outside. The St Louis Police know me well, because when I can’t reach him they go to his house for me. We have built a closer relationship in the past decade than we had while I served 20yrs in the Army. I thank God for allowing me to survive 9/11 the attack of Pentagon, and have a chance to be my Daddy’s “Princess” again. I admire you so much, you are awesome.Have a Bless and safe 4th. I love myself some Dr. Dee Dee!!!! That was a good message. I love Love…..
Love you Dr. Dee Dee thank you for that simple but yet powerful message you just gave on this Independence Day. Freedom from things that hold is bound forever grateful to God for you can’t wait the day I can give you a big hug and meet you. I love the vlog and am encouraged to make the most of my moments with others! 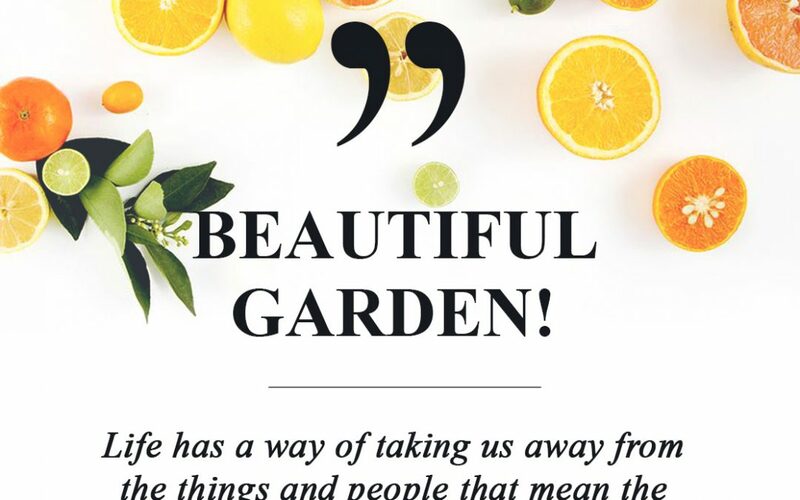 I love and am inspired by that garden, too. 😍 God bless you and your family! Thank you so much for sharing and enriching our lives! Awesome word, I love it. Thank you. Good word, thank you for sharing an awesome word. Awesome Dr. Dee Dee….thank you for be an example of what standing in faith “looks like”. I saw your faith with Dr. Mike as he was overcoming his health challenge. Because of your example, I was able to stand in faith for my son who had a mental attack, my husband and I prayed with the staff members, and we see HEALING POWER OF GOD moving in a “MOUNTAIN MOVING FAITH WAY”!! Bless you Women of God. Thank you for sharing this. I love how God uses our testimonies to encourage the faith of others. Your Dad, with his garden reminds me of my Grandfather when I was younger in his garden. Blessings to you and your family. Thank you for being a faithful woman of God and a Godly example!! Certainly spoke to me and my need to invest more in relationships. As always, thank you Pastor DeeDee for this “right on time” reminder. Peace and Blessings. Awesome!! Confirmation that I am on point!! Building and Re-building relations new and old ones. Planting new seeds!!!! On time word, cultivating relationships. Anything worth having is worth working for. Thank you for sharing Dr. Dee-Dee. My dad is 84, still preaches and teaches and we are each other’s garden buddies. Nice to know someone shares my reality. The garden has created a true bond between my dad and I. Stay Blessed! I wish I knew when I was younger what I know now. Growing up with negative and bad practices only keeps us from operating in our best potential. Thanks deedee. I love how you take some that seems so simple and turned it into a life lesson. That’s powerful. And this came right on time because someone I knew for over 20 years I just was about to cut her off. I felt as if she wasn’t being a true friend to me. But God would always put her face before me. She sent me a message today. Needing prayer,guidance and a friend I was so sympathetic and concern. From this day I will do what’s needed to build a better relationship because I truly love her. I have the truth, so it’s my duty to lead. And to better in every relationship. Thank you for your words of wisdom and encouragement. AWESOME!!! thanks Dr.DeeDee I love how your FAITH are provoking other to have Faith I love it my Faith is growing by watching you and reading GOD’s Words. thanks Dr.DeeDee for sharing with us. Hello Dr. Dee Dee, And yes you did it again! What a great, empowering and sincere word. I love the nuggets and reminders that God has placed in you that you continue to share with us. I’m so grateful to be a part of SOFCC and your Blog. I am also putting that big word we learned at the last Infusion session, AMALAGAMATION to use. I will be a guess Author on the Power Of Purpose Radio show on tomorrow so pray for me. I’m hoping to make an impact in someone’s life, in hopes of helping them to propel to their next level or their next goal. You are simply the best and we so appreciate you! This was an “on time” message Dr. DeeDee. Thank you! Serious garden…Dr.Dee Dee, you are such a good friend and daughter, I had this experience on Sunday, extending my friendship to a sister at Church. Thanks for reminding us of the things that matter. BTW, it is very nice to have you back with Dr Mike and us @ TH. Thank you Mrs Freeman, you always be right on point with your messages. I am trying to be a better person and with that build better relationships. So you just reminded me how important it is to work for what you want!! Thanks again and may God continue to bless you!! Connected with my blood sisters by email, but oh what a start! Thanks again for sharing. (Would I tell you if your breath smells of garlic?!) Bet I would. My Pastor, sister,friend. I thank God for your ministry. Good word! I am so glad i learned this lesson before my mom passed. I had a friend tell me to kiss my moms face every chance i could. She has been gone for 6 yrs now, and when i close my eyes i can still feel my lips on her cheek! Great blog post! The wisdom you provided in this post is priceless! Relationships are hard to build, especially with women at times due to our nature. But those who are willing to stay in the evolution process to see the outcome, will be blessed by a fruitful relationship ❤️! Thank you for sharing! Amen Dr. Dee Dee you are so right thank you for sharing and keeping us all connected Love you! Thank you for the message. This video just reminded me that I need to spend more time with my 80 year old grandma!! I love her dearly and I want to make sure she knows it!!!! Dr. Dee Dee…Thank you so much for this reminder! !I agree, relationships are so very important and the cultivation and nurturing of relationships to maintain growth and connection is essential. God is LOVE is God! Love you and God Bless You!! Those are some good looking greens, Dad Wooten! Lesson received, Dr. DeeDee!